The skies wept bitterly over the Okayama International Circuit today, and the opening round of the 2019 Autobacs Super GT Series was called after just 30 of the scheduled 82 laps were completed in the Okayama GT 300km Race. Once the rain started during the morning Warm-Up session, it never stopped. 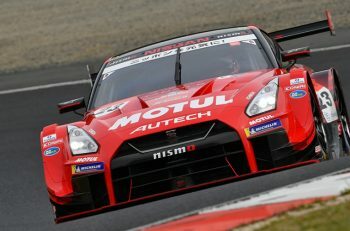 The race officially began under a Safety Car start for the first three laps of the race, with the #23 Motul Autech NISMO GT-R of Ronnie Quintarelli (with Tsugio Matsuda) leading the field to green on Lap 4. From 3rd, the #1 Raybrig Honda NSX-GT of defending champion Naoki Yamamoto (with Jenson Button) made a brilliant pass for 2nd on the #12 Calsonic Impul GT-R of Daiki Sasaki (with James Rossiter). But after just 30 seconds of green flag racing, the Safety Car was brought out for the second time during the race. The #25 Hoppy Toyota 86 MC of Kimiya Sato aquaplaned out of control through the First Corner, sending the pink and white Hoppy 86 spinning into the inside barrier – and clipping the #5 Advics Mach Syaken MC86 of Yuya Hiraki on its trajectory to disaster. Both cars retired just seconds into their races. The rain was getting heavier when the race restarted on Lap 11. Those conditions played into the hands of the defending champions at Team Kunimitsu. Right off the restart, Yamamoto got a run on Quintarelli’s Motul GT-R, and swept past around the outside at the First Corner to take the lead, much to the delight of Yamamoto’s co-driver Button. The mid-engined Honda NSX-GTs on the Bridgestone-clad tyres had a clear advantage in the wet conditions, including the #17 Keihin NSX-GT of Koudai Tsukakoshi (with Bertrand Baguette), last year’s winners in GT500. They’d made their way up to second place in short order, and Hondas now led 1-2. Then on Lap 13, the race was neutralized under a Red Flag for the first time in the afternoon. The #88 ManePa Lamborghini Huracán GT3 of Takashi Kogure and the #10 Gainer TanaX triple a Nissan GT-R of Kazuki Hoshino were battling side-by-side for position when they made contact at the exit of Williams Corner, sending Hoshino head-on into the sponge barriers at high speed. João Paulo de Oliveira, driving the new #7 D’station Aston Martin Vantage GT3, could do nothing to avoid being caught up in the wreck himself and smashed into the #10 Gainer GT-R.
And while trying to avoid the wreck, the new #33 EVA Racing X Works GT-R of Marchy Lee crashed into the sponges at the Moss-”S”, and was tagged by the #360 RunUp Rivaux GT-R of Takayuki Aoki. This pileup eliminated another four cars from the race. But most thankfully, all drivers involved were okay, including Hoshino who took the worst damage from the incident. After 45 minutes under the Red Flag to clean up the wreckage, the cars got underway again. The rain wasn’t relenting, but after circulating under the Safety Car for several laps – which saw Nick Cassidy in the #37 KeePer TOM’s Lexus LC500 spin in the standing water and drop to the back of the field – the race finally restarted on Lap 20, and thus began the longest period of green flag racing all afternoon – a whopping four laps of it. 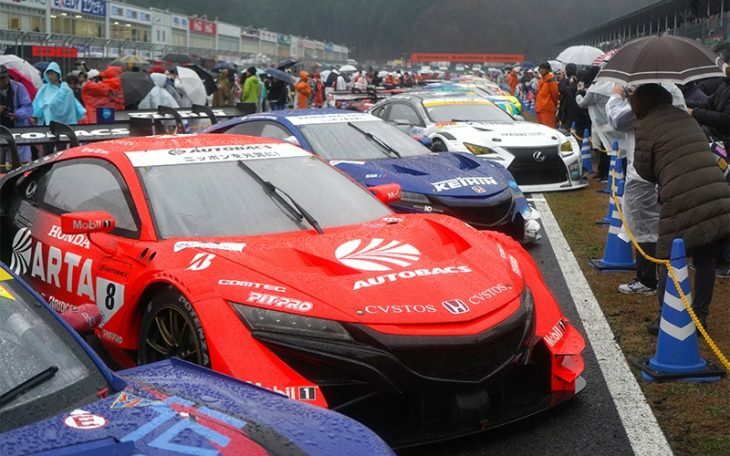 The Hondas were still outpacing the Nissans in the wet conditions, and the #8 ARTA Honda NSX-GT of Takuya Izawa (with Tomoki Nojiri) took third place from pole-sitter Quintarelli at the Hairpin Curve on Lap 20 – putting Hondas 1-2-3 in the grid, and eventually, all four Nissans would run behind them, 4-5-6-7. Tsukakoshi was now gaining on race leader Yamamoto, and it looked as if a thrilling duel in the rain was in store. But right at the start of Lap 24, the battle ended prematurely when the pursuing Keihin NSX hit the Raybrig NSX, sending Yamamoto and the royal blue Raybrig NSX spinning into the gravel trap and bringing out the fourth Safety Car intervention of the race. Yamamoto was able to escape the gravel trap, but lost a lap and the Raybrig NSX would finish 15th and last. Under that safety car, the #50 Arnage Racing AMG GT3 of Ryosei Yamashita aquaplaned out of control and crashed in the Moss-”S” curves on its own. The conditions were getting worse, and at 4:27 PM JST, the race was red flagged for the second and final time, and declared official after 30 laps of racing. For the first time in the 25-year history of the Autobacs Super GT Series, half-points were awarded after the race was abandoned short of the requisite 75 percent distance to award full championship points. The last race to be completely abandoned due to inclement weather was the 1998 All-Japan Fuji GT Race, due to heavy fog and rain and the near-fatal crash of Tetsuya Ota. It took another hour after the race was stopped for an official result to come in in GT500. The #17 Keihin NSX was tagged with a 34-second time penalty, equivalent to a Drivethrough Penalty, for avoidable contact on the part of Tsukakoshi – which dropped him and Baguette from 1st on the road to 14th. “I was watching the monitor throughout the race,” said Nojiri. “It felt like forever before the race ended. More than being happy that we won the race, I’m just glad that none of the drivers were badly injured. It’s the fourth career GT500 victory for Nojiri, and the seventh for Izawa. Both drivers received 10 points each in the standings, despite Nojiri not having driven a lap due to the extreme circumstances – though he was helmeted up to drive just in case the race did restart. With the Honda podium clean sweep broken up, the new-look Nissan fleet held on to lock out the rest of the top five, led by the #23 Motul GT-R of Matsuda and Quintarelli in second, and the #12 Calsonic GT-R of Sasaki and the returning Rossiter in third. Back after five years away from Super GT, Frédéric Makowiecki made the most of what little time he had to race in the rain – and finished fourth in the #3 CraftSports Motul GT-R (with Kohei Hirate), ahead of the #24 Realize Corporation Advan GT-R (Mitsunori Takaboshi/Jann Mardenborough) in fifth. 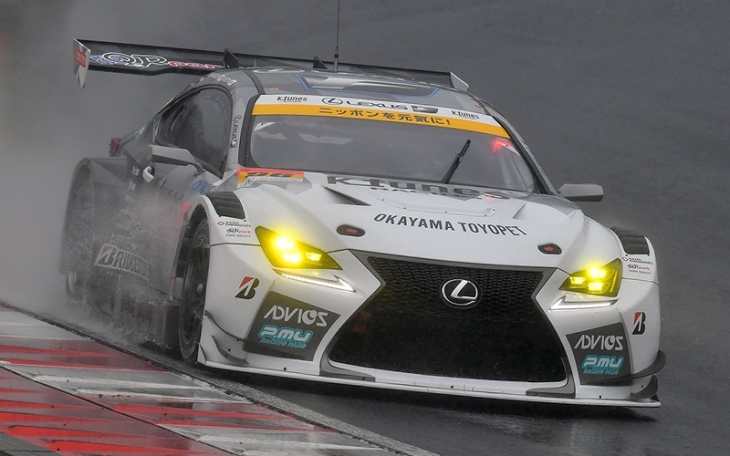 The best of the Lexus LC500s was the #19 WedsSport Advan LC500 (Yuji Kunimoto/Sho Tsuboi) in sixth place, as most of the Lexus teams failed to make up ground in the limited green flag running wet conditions. In GT300, the #96 K-Tunes Racing Lexus RC F GT3 of Morio Nitta and Sena Sakaguchi took victory at the team’s home track. Nitta took the start in second behind pole-sitter Shinichi Takagi in the #55 ARTA Honda NSX GT3 (with pole-winner Nirei Fukuzumi). The old teammates ran together during what little racing there was to have, and Nitta’s pass on Takagi through Williams Curve (Turn 2) on Lap 12 turned out to be the race-winning move, overshadowed by the carnage around them in the GT300 class. With the victory, Morio Nitta reclaims first place on the all-time GT300 career wins list – the 21st of his career. As for Sakaguchi, the 19-year-old rookie became one of the very few Super GT drivers to win in their very first race in either category – despite not having driven a lap himself! “I didn’t run in today’s race, but I think I made a contribution to the team by helping to get us a spot on the front row of the starting grid in yesterday’s qualifying. Second was the #55 ARTA NSX GT3 of Takagi and Fukuzumi, a great first outing for ARTA’s new Honda NSX GT3 EVO. And in third, the #52 Saitama Toyopet GreenBrave Toyota Mark X MC of Shigekazu Wakisaka and Hiroki Yoshida scored the team’s first-ever Super GT podium in their third season, in their first race on Bridgestone rubber. The #61 Subaru BRZ R&D Sport (Takuto Iguchi/Hideki Yamauchi) finished fourth, and after the #11 Gainer TanaX GT-R (Katsuyuki Hiranaka/Hironobu Yasuda) was penalized 32 seconds for pushing the #56 Realize/Nissan Mechanic Challenge GT-R GT3 (Kazuki Hiramine/Sacha Fenestraz) off at Attwood Curve, the #56 Realize GT-R took fifth place. 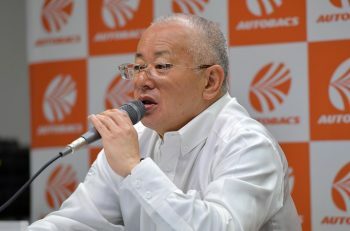 The Autobacs Super GT Series returns in just under three weeks’ time to legendary Fuji Speedway for the annual running of the Golden Week classic, the Fuji GT 500km Race on 4 May.